MERRIMACK, New Hampshire, November 19, 2012 — GT Advanced Technologies, a leading manufacturer of vacuum and high temperature furnace systems, recently manufactured and shipped a 10-ton force capacity hot press to a prominent domestic research university. 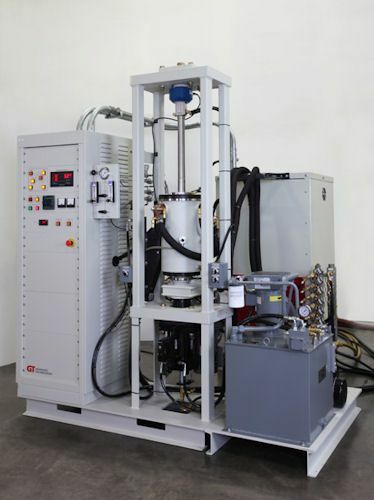 The system will be utilized for pressing and sintering ceramics. This bell-jar style hot press offers 360° exposure to the punch and die, a cylindrical graphite hot zone rated to 2000°C and operates in an inert gas, high vacuum environment. GT’s Model HP20 provides a 4-inch diameter work area with a convenient bell-jar raising configuration, permitting direct and unrestricted access to the work area. This system offers precision force control and displacement measurement with accuracy of better than 0.5% of reading. The HP20’s Eurotherm 2704 controller and advanced software are linked with a high speed force and motion regulator to provide automatic turn-key batch control and data acquisition. GT’s hot press systems are designed for the simultaneous application of high temperature and high force levels. Primary applications include densification of powdered materials, diffusion bonding of solid components and processing of fibrous composites. GT is a leading U.S.-based manufacturer of hot pressing and advanced thermal processing technologies. GT offers a wide range of high temperature furnaces with over 3000 installations in 40 countries, decades of technical innovation, process knowledge, full-factory testing, installation assistance and aftermarket support.